The Bible often compares life to a walk, because life is a journey. We’re not sitting still. “And now, just as you accepted Christ Jesus as your Lord, you must continue to follow him” (Colossians 2:6 NLT). It’s safer. Have you ever walked alone at night through a dark alley or down a lonely country road? It’s a little scary. But if you have another person with you, you feel safer. It’s supportive. Life is not a 50-yard dash. It’s a marathon! 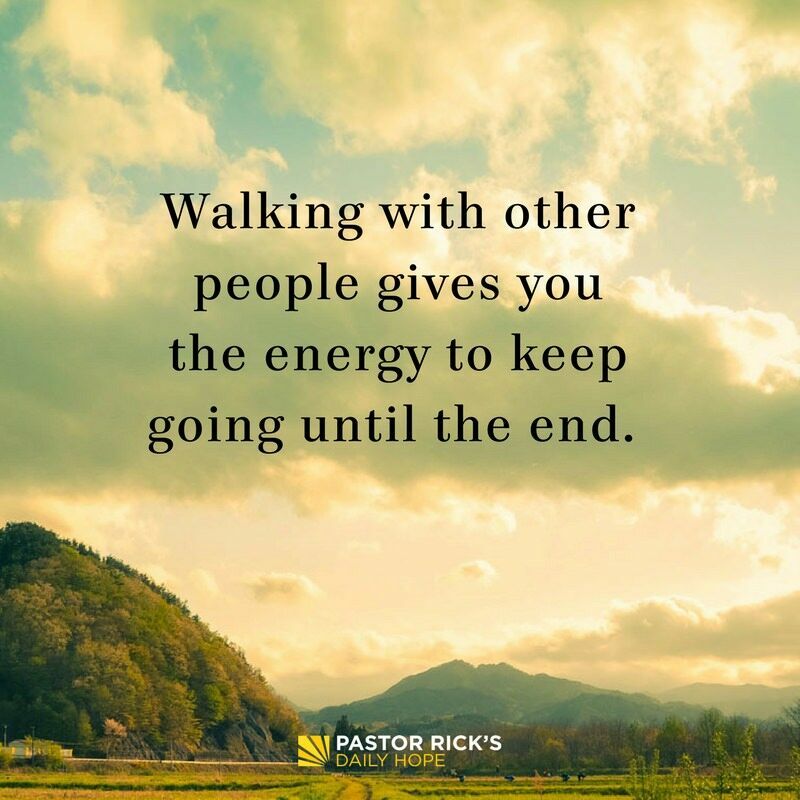 Walking with other people gives you the energy to keep on going until the end. It’s smarter. You learn more by walking with others than by walking alone. If you’re walking alone in the wrong direction, you may never realize it. But if you have a friend beside you, one of you is likely to recognize that you’ve veered off the path and need to find the right direction. We learn some important lessons when we walk alongside other people. We learn how to get along and cooperate with others. We also learn how to love. Genesis 2:18 tells us, “It is not good for the man to be alone” (NIV). God hates loneliness, and community is God’s answer to loneliness. When we walk alongside other people, we find a community where we learn how to love. And walking alongside other people also teaches us hospitality. The Bible says in 1 Peter 4:9, “Offer hospitality to one another without grumbling” (NIV). What’s your grumble? What’s your excuse for not opening your home to friends? Can you put three people in it? Jesus says, “Where two or three gather in my name, there am I with them” (Matthew 18:20 NIV). Everybody has a longing for belonging, because God made us for relationships. When we walk alongside other Christians in community, we find that longing satisfied. How has your life been enriched by the people who faithfully have walked or are walking alongside you? What excuses have you used to avoid practicing hospitality? How can you change your perspective and attitude? 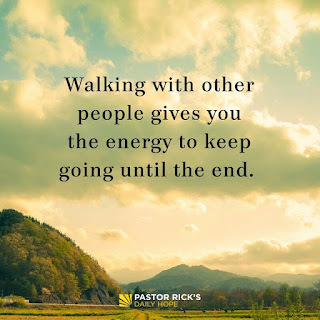 What people can you walk with through life? With whom can you learn to walk like Jesus?